Falls Church, Virginia. Major General Susan Mashiko, USAF, Deputy Director, National Reconnaissance Office (NRO) in Chantilly, VA, told JAVA members of the role played by the NRO in the Washington intelligence community. 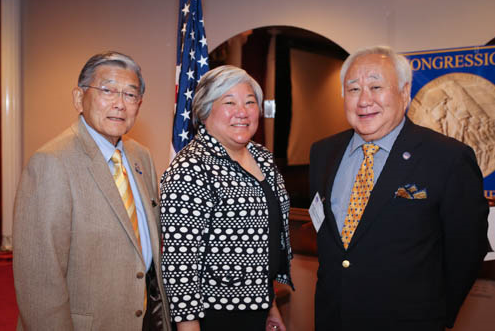 General Mashiko, the only Japanese American woman of general rank, was the keynote speaker at the JAVA quarterly luncheon on June 15, 2013 at the Harvest Moon Restaurant, Falls Church, Virginia. She was nominated for the United States Air Force Academy by then Congressman Norman Mineta in 1976. She graduated from the Academy in 1980 and made history as she was in the first class of women to graduate from the U.S. Service Academies. L-R: Secretary Mineta, Maj Gen Mashiko, USAF, Gerald Yamada. She recalled an event from early in her career as a Captain stationed at Los Angeles Air Force Base. Then Capt Mashiko picked up a phone call and the Colonel on the other end was in Washington DC. He proceeded to congratulate her on becoming a program manager. She assumed that was a practical joke as only majors and above were selected as program managers and hung up on the colonel. After the second phone call and subsequent hang up, her colonel walked into the office. When the phone rang this time, the colonel picked up the phone and pushed it to her ear and ordered her to listen fully to the phone call. The colonel was serious.